At first it was granite stone of 5 to 6 feet wide. Now it is covered by Panchloha in the year 1985. The vertical steps are so significant and blessed no one can scale them without fasting for 41 days and carrying the holy irrumudi bag on head. There are many mythology connected with the holy Patinettampadi. Some believe the eighteen steps denotes the 18 puranas. 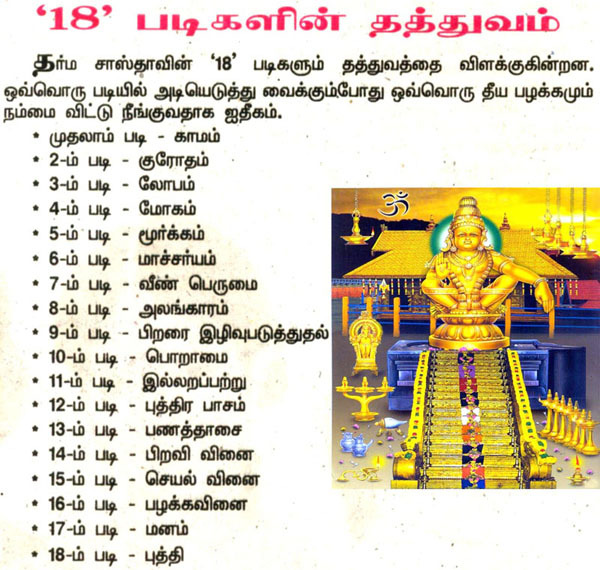 Some say that 18 weapons with which Lord Ayyappa destroyed the evil denotes the 18 steps. Others are of the belief that the first five steps denotes the indriyas (eyes, ears, nose, tongue and skin). The next eight steps signifies the ragas (tatwa, kama, krodha, moha, lobha, madha, matsraya, and ahamkara. The next three steps signifies the gunas (satwa, rajas and thamas). The seventeenth and the eighteenth denotes vidhya and ignorance. 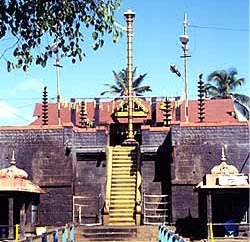 The Patinettampadi can be used only twice - once for climbing the temple and once for downward below leaving the hill. Before climbing or downward the steps, pilgrims break coconut as an offering to the steps. One needs to have the sacre Irumudi bag on head while going up or down the 18 steps. While downward the steps the devotees climb down backwards facing the sanctum sanctorum.